Every two years the best college-age Ultimate Frisbee players from each country around the world represent their nation in the World U-23 Ultimate Frisbee Tournament. In the US, five hundred women were nominated for the team. 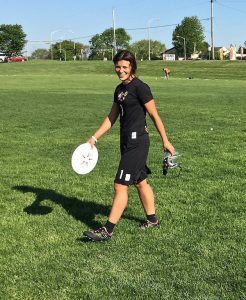 Coaches held tryouts for 100 women, with fifty player try outs on each coast, then selected a group of 24 National Team members to represent the US in July at the World Ultimate Games, in London, July 11-18, 2015. Lyra Olson, daughter of Dr. Eric Olson, was selected for this team. Dr. Olson will attend the games, serving as the US National team’s orthopaedic surgeon. Lyra is thrilled to be a member of this elite group. 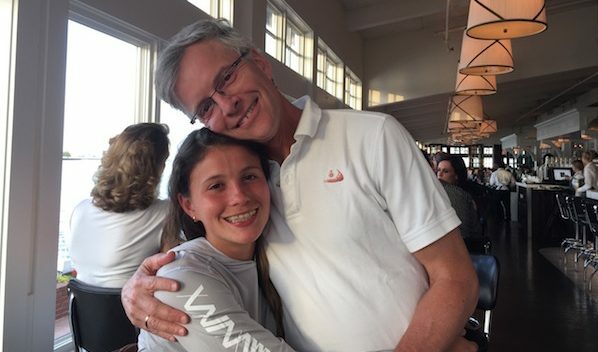 She will be starting her senior year at Princeton University this fall, where she is studying Neuroscience. Lyra is a captain of Princeton’s Women’s Ultimate team, Lady Clockwork, which just completed its most successful season. The team won the “Metro East” Regional Tournament, defeating Columbia, Cornell, and UConn, which qualified them to go to the Division I (D-I), National Collegiate Championships, held May 22-24 in Milwaukee, Wisconsin. No team from the Metro East Region had ever won a game at the D-I National Championship level until this year, when Princeton beat 8th seed Notre Dame, to finish 13th overall in the nation (USA Ultimate D-I College Championships). Unlike most competitive sports, Ultimate Frisbee is self officiating, and emphasizes “The Spirit of the game” at all levels. Players call their own fouls, and treat their opponents with respect. To foster these ideals the Ultimate Frisbee organizing body has each team rate their opponents after every game on their spirit: knowledge of rules, handling of fouls, fairness, attitude, and communication. Among the Princeton teams accomplishments this year, being named 2015 National Championships Team Spirit Award Winner among the twenty best college women’s Ultimate teams is a true highlight. (2015 D-I College Spirit of the Game Report). Lyra Olson was selected for the individual spirit award for Princeton’s team. Lyra, and her co-captains Sherry Li, and Jane Urheim were also chosen 1st team All-Region for Metro East, with Jane winning player of the year. Lyra has been chosen as “Spirit Captain” for the US national team. The team is playing together for the first time at a warm-up tournament in Eugene, Oregon, June 20-22. The team will have a week-long training camp this July, prior to traveling to London for the World games. Dr. Eric Olson also played Ultimate Frisbee for Princeton, and is thrilled to help provide medical support to outstanding athletes playing Ultimate at the highest level on the world stage this summer. He also recommends “Vitamin F” that is playing catch with a Frisbee every day to enhance one’s enjoyment of life and sense of having fun.